Of all the various film genres, comedies suffer from the biggest threats to longevity. Because humor tends to connect to its era, what one generation finds amusing may fall flat in later years. This seems especially true when the work in question relies on dialogue for its wit. Sure, physical pieces like those of Charlie Chaplin or the Three Stooges might translate well to future generations, but would something language-intensive still hold up decades later? 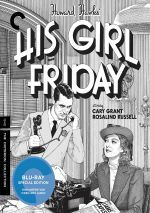 In many cases, the answer is “no”, but in relation to 1940’s His Girl Friday, the reply is a resounding “definitely”. While the clothes and settings show their age, the rest of the movie does not, as the material remains fresh and vibrant after more than seven long decades. Friday adapts the successful stage play The Front Page for the screen with one major variation: it uses a woman to play hot-shot reporter Hildy Johnson. With this gender shift, Hildy’s editor Walter Burns becomes not only her boss but also her ex-husband. This change feels natural, so no seams show due to the modifications. As the movie starts, Hildy (Rosalind Russell) announces to Walter (Cary Grant) that she’s quitting the paper to marry sweetly bland insurance salesman Bruce Baldwin (Ralph Bellamy). Throughout the rest of the film, Burns schemes to recapture Hildy both as reporter and spouse. Though we never doubt the outcome, Friday provides a fun ride as the picture covers a busy day in the life of these characters. This becomes intense because their coverage of a controversial execution adds urgency. Grant and Russell display tremendous chemistry in their roles. The two have a cattily chummy relationship and the sparks frequently fly between them. One can easily believe that the two have been close for years due to the attitudes displayed by the actors. Both Grant and Russell offer fine performances that offer some of the movie’s best aspects. Friday requires adept and quick-witted actors for its leads because it includes some almost-insanely rapid-fire dialogue. This is a film well-suited for home video because a) you’ll want to watch it again to hear what you missed, and b) you may want to activate the subtitles so you’ll pick up on everything said. The lines seem clever and delightful throughout the movie and they keep you on your toes. You must pay a great detail of attention to make sure you don’t miss anything. The movie manages to seem especially modern in the way it utilizes self-referential techniques. 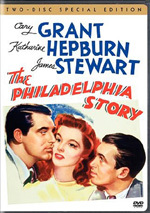 It was one thing for Burns to refer to “Archie Leach” - Grant’s real name - but altogether more audacious when Burns describes Bruce as resembling “that fellow in the movies - you know, Ralph Bellamy”. It’s a twist that could backfire but seems funny and charming here. However, Friday doesn’t need trivia games to make it entertaining, as it holds up quite nicely after many decades. It’s an amusing and quick-witted anti-love-story that sparkles due to fast-paced dialogue and warm chemistry between its stars. His Girl Friday offers a great comedy. His Girl Friday appears in an aspect ratio of approximately 1.33:1 on this Blu-ray Disc. This became a fine transfer for an older movie. Sharpness seemed consistently positive. Only slivers of softness ever materialized, so the vast majority of the flick appeared accurate and well-defined. I saw no shimmering or jaggies, and edge haloes remained absent. Black levels seemed nicely deep and rich, and contrast appeared quite strong. Shadow detail was consistently clean and smooth throughout the movie. The movie offered natural grain, and it lacked print flaws. The image held up well. The film’s PCM monaural also worked fine for its age. Dialogue was distinct and relatively natural, and I noted no signs of edginess or problems related to intelligibility. Effects appeared crisp and acceptably realistic, with no distortion or problems. The movie featured almost no score. A few brief snippets of music appeared on a couple of occasions but these were so minor that they might as well have been non-existent. During those short periods, however, the music sounded fine and displayed no concerns. You won’t be dazzled by the audio of His Girl Friday, but it held up nicely for a 76-year-old mix. How did the Blu-ray compare to the DVD release from 2000? Audio was fairly comparable – the Blu-ray offered a little extra clarity, but there wasn’t much that could be done with such old material. On the other hand, visuals showed the expected improvements. While I liked the DVD, the Blu-ray offered superior definition, better blacks/contrast and reduced print flaws. The Blu-ray became the strong presentation. This Criterion Blu-ray mixes old and new extras, and we start with Hawks on Hawks. It runs 10 minutes, 27 seconds as it delivers snippets from a few interviews with director Howard Hawks. He gives us a mix of thoughts related to Friday in this useful compilation. Lighting Up with Hildy Johnson goes for 25 minutes, four seconds and offers notes from film scholar David Bordwell. He provides an appreciation of Friday as well as a dissection of some of its techniques and its place in film history. Bordwell keeps this a chatty and informative piece. Four archival featurettes appear as well. We find “On Assignment” (8:47), “Rosalind Russell: The Inside Scoop” (3:14), “Howard Hawks: Reporter’s Notebook” (3:23), and “The Funny Pages” (3:28). Across these, we hear from authors David Thomson, Molly Haskell and Todd McCarthy. These shows go over interpretation of cinematic techniques, notes about Hawks and actor Rosalind Russell, the adaptation of Front Page and aspects of the Friday production. The featurettes tend to be fairly superficial due to their brevity but they add a smattering of decent tidbits. In addition to two trailers, Disc One finishes with a Lux Radio Theatre broadcast of His Girl Friday. From September 1940, the show runs 59 minutes, 30 seconds and recasts Claudette Colbert as Hildy and Fred MacMurray as Walter. Those actors become the main drawback to “Lux”, as they just don’t compare to Grant and Russell. Neither can bring the necessary sardonic bite to the parts, so they seem limp. Still, it’s fun to hear the broadcast as a historical curiosity. Over on Disc Two, the main attraction comes from the 1931 Lewis Milestone version of The Front Page. The film goes for one hour, 41 minutes and eight seconds, as it tells the same essential story as Friday. Like I noted in the body of my review, Friday alters genders, so Page brings us a male Hildy Johnson (Pat O’Brien). This removes the romantic connection between Hildy and Burns (Adolphe Menjou), and other differences occur as well, but overall, both versions remain pretty similar. As a film, the 1931 Front Page seems fine, but it pales in comparison to Friday. If you choose to watch both, I’d recommend you screen Page first because its predecessor seems so much less vibrant. This doesn’t make Page bad, and I like the visual panache Milestone brought to the project. As he did with 1930’s All Quiet On the Western Front, the director gave the film much more style and flair than one expects from an early 1930s movie, and that sense of confidence adds luster to the project. Page simply feels stagnant when compared to Friday. While fully competent and moderately entertaining, the 1931 Page just can’t compete with its 1940 remake. The quality of the Blu-ray fell short as well. Actually, audio seemed fine – while never robust, the movie delivered adequate sound that lacked intrusions from background noise. Visuals fared less well, as Page tended to be mushy. Sharpness was never better than okay, and the movie suffered from a lot of awfully soft spots. Blacks generally appeared flat and inky, and overall contrast looked faded and flat. The image did lack print flaws, and it remained watchable. However, it seemed moderately unattractive, especially when compared to the excellent visuals for Friday. For a look at technical efforts, Restoring The Front Page lasts 24 minutes, one second and delivers notes from former UNLV Department of Film chair Dr. Hart Wegner, UNLV founding artistic director Francisco Menendez, AMPAS film archive director Michael Pogorzelski, UNLV professor/chair Heather Addison, AMPAS film preservationist Heather Linville and Audio Mechanics chief engineer John Polito. They talk about the methods use to bring about the version of Page on the Blu-ray. This turns into an insightful chat related to the different issues. Ben Hecht fills 25 minutes, 43 seconds with info from historian David Brendel. As expected, the piece discusses the screenwriter’s life and career, with some emphasis on Front Page. Brendel brings us a nice summary. Disc Two throws in two radio adaptations of The Front Page. The 1937 version (58:45) uses Walter Winchell and James Gleason as the leads, while the 1946 broadcast (31:42) brings back Pat O’Brien and Adolphe Menjou from the 1931 flick. Though radically abbreviated, the 1946 broadcast fares best. That’s because the actors seem much more competent and fill their roles well. Though the 1946 show lops off a lot of the story, it still becomes an enjoyable performance. On the other hand, the 1937 take flops, largely due to a terrible lead performance from Winchell. He dominates the piece and seems entirely wrong for Hildy, as he plays everything for ultra-broad comedy. It’s not entertaining. Interesting footnote: at the start of the 1937 broadcast, we get an apology for the absence of aviator Amelia Earhart, as she was supposed to appear at the end of her around-the-globe flight. The host tells us he hopes we’ll get to hear from Earhart the next week. Of course, that never occurred, as Earhart disappeared during her trek and was never heard from again. It’s intriguing – and a little spooky – to encounter these discussions of Earhart given the knowledge we possess that the radio participants didn’t. Finally, the set offers a foldout booklet. Designed to resemble a newspaper, it includes the usual mix of essays and credits. I like the unusual format and find good material in here. Other than some politically incorrect material, His Girl Friday holds up well over the last 76 years. The movie offers bright characters and lots of laughs. The Blu-ray boasts excellent visuals as well as solid audio and a nice selection of supplements. Friday becomes a must-have for fans of classic films.